Chatham County, NC – We all know and love Chatham County for it’s wonderful lakes, rivers, walking trails and parks, not to mention it’s unique houses and homes. 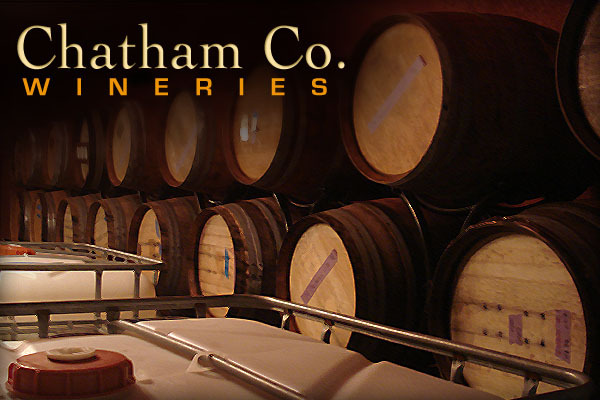 But did you know that Chatham is also part of North Carolina’s blossoming wine industry? Here are three wineries you can visit without ever leaving Chatham County. Silk Hope Winery is a small, family owned winery offering award-winning wines since 2000. Visitors can tour the vineyard and sample the wines in their tasting room, all in the setting of a real functioning farm. There is a picnic area open to guests, and they even have a grill that you can use with a little advanced notice. Hours: Thurs. – Sun. open until 6 pm. Tucked away in the rolling hills of the Mt. Vernon Springs area in far western Chatham County is this premiere, award-winning and nationally recognized boutique winery. Vineyard tours and wine tastings are available. The small tasting fee comes with a souvenir glass. Winery also offers a lovely picnic area as well as a gift shop. Sun. 1-5 with tours at 2 pm, and 4 pm. For something a little bit different, why not check out North Carolina’s newest honey winery. Starrlight uses local NC honey to craft their award-winning honey wine, commonly known as mead. Although many people categorize mead with beer, it actually is much closer to wine than to beer. Mead is created using the same process and equipment as wine, and like wine, can vary in taste, color and dryness (or sweetness). If you’ve never tasted mead before, this should be a must-try on your winery tours. VisitNCWine.com has a great interactive map of wineries across the state. Nearby Alamance County has Wolfe Wines (Snow Camp) and Benjamin Vineyards (Graham). Just north of where I live (Monterrane) across I-40, there is Iron Gate, GlenMarie and Grove Wineries. My friends at CaryCitizen.com just did a story about a day trip to the Yadkin Valley Wine District (near Winston-Salem). For lovers of the grape (and mead! ), North Carolina is a rising star. And right here in Chatham County, right here in Pittsboro in fact, you can get a taste of what the future holds for wine. Do you have a favorite local winery? Want to know about living in Pittsboro and Chatham County? I’d love to hear from you. Photo by Julie Roland. All rights reserved.